When we got engaged, I couldn't decide: should I request a wedding greeting early and receive one from the president I've so far most admired, the one who, after the recession ushered me into adulthood, seemed to take my hand and fix things? Or, should I wait until our actual wedding day (October 21st!) and get a letter from the very first female president of the United States? I think you know how that went. I put in a request for our letter almost immediately after the election, and all through Christmas card season, I impatiently checked our mailbox, half terrified it would get wet, like much of our mail does, when snow melted through the rusted out mailbox. Honestly, I wish I could say that getting so many lovely Christmas cards was a consolation, but I was decidedly ungrateful for holiday cards, and each one felt like a reminder that I might not get a wedding letter from the Obamas at all. When we visited Emily and Taylor for New Years, I had just about given up, but they told me to hold out hope; Emily had gotten a signed photo some months earlier. And then, the very day that we decided on our venue, it appeared in the mail, bone dry and perfectly beautiful. I literally jumped up and down when I saw it, and then proceeded to open it very carefully with a knife. Right now, it's living in a bible on my bookshelf. I read this article, To Obama With Love, and Hate, and Desperation, today and thought how true it is that we all just want to feel heard. 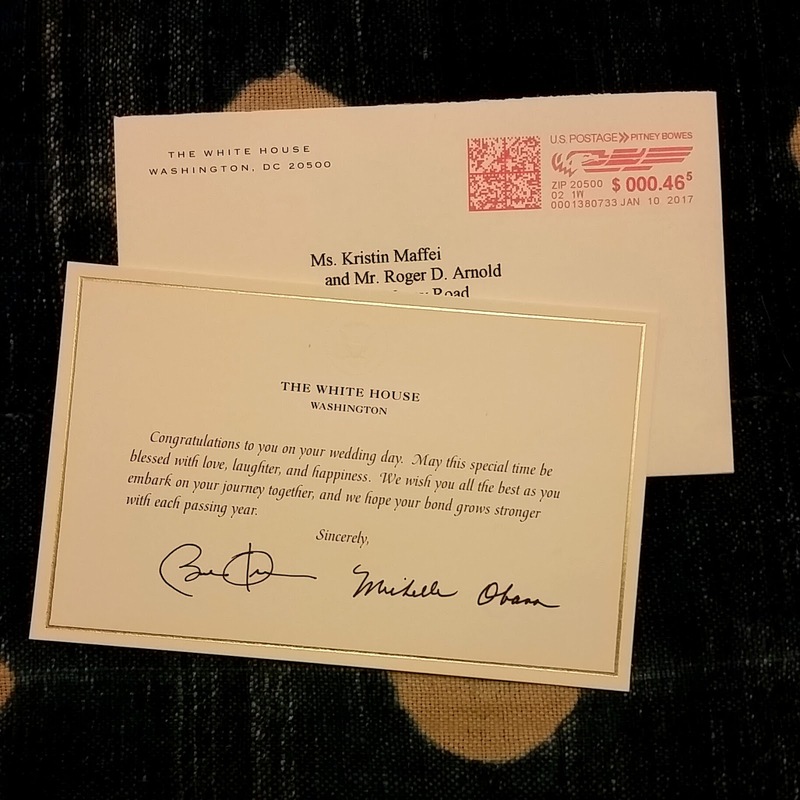 I'm still mourning the loss of this president, the first president of my adult life, and all he represents, but for that one gleaming moment, opening the envelope, I felt heard.